← Looking for a last minute Christmas present…how about an exotic cookery course? I recently paid a return visit to The Sarvari Research Trust at Henfaes where David Shaw, the Director of Research gave me a guided tour of the farm and told me about the work they carry out there. The Sarvari Trust is a not-for-profit spin-off company of Bangor University that breed a new, late blight resistant type of potato. 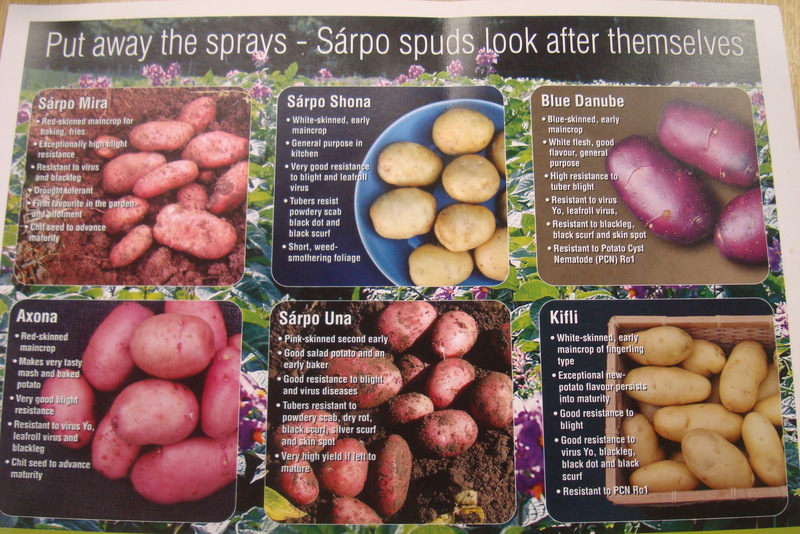 Sarpo (pronounced sharpo) potatoes yield heavy crops, are grown with low chemical and energy input and are GM free, they are also very resistant to virus diseases. The potatoes were first grown in Hungary by the late Dr Sarvari Snr, who was director of Keszthely Research Institute (now University of Pannonia Georgikon Faculty of Agriculture, Potato Research Centre). At the request of his Soviet bosses he developed a hardy strain of potatoes that could be grown across the USSR and which would survive the ravages of the harsh climate and disease. Our own climate in Wales although not as harsh as the Russian one, is somewhat inclement, so a hardy blight resistant potato is well needed. They also have a naturally long period of dormancy which means they will keep well without refrigeration and won’t prone to sprouting. They are perfect for the kitchen gardener, or allotment holder that wishes to store their potatoes through until the following spring and who like their crops to look after themselves! I wondered if this blight resistance would have an effect on taste and David gave me three varieties to take away and try. 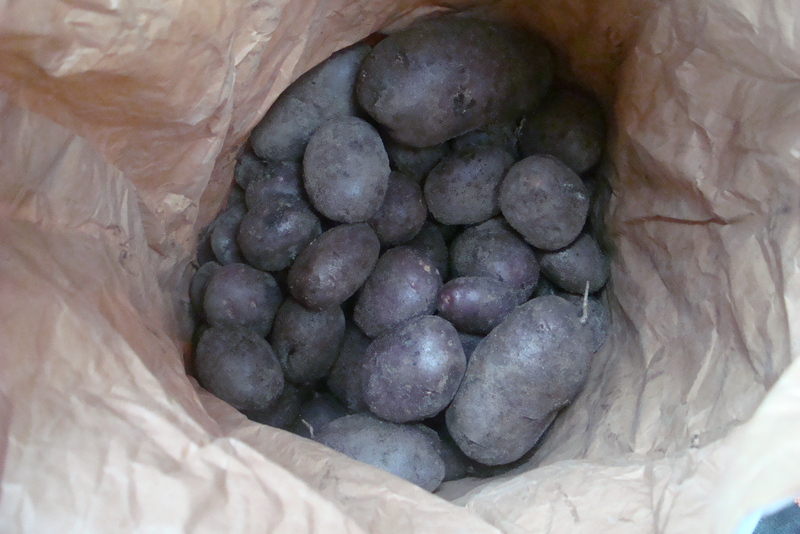 The Sarpo Mira (a good general purpose floury main crop potato, recommended for baking, roasting and chipping), Kifli (an early main crop, quite waxy and best cooked as salad potatoes in their skins) and the Blue Danube (early main crop, best mashed, chipped, baked and for general purpose). I decided to try the Blue Danube first and see how they roasted and oh my goodness! They were delicious. I part boiled them for 5 minutes and then tossed them in hot vegetable oil that had heated in a roasting pan in the oven. 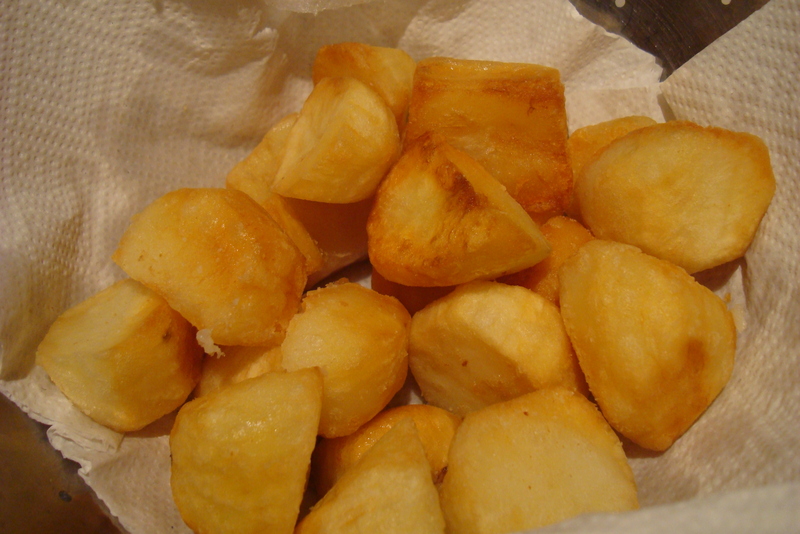 This is the secret to good roast potatoes…the oil must be spitting. Sprinkle with a little Halen Mon sea salt and return to the oven on a high gas (6 or 7, 220 degrees) for about 45 minutes until golden brown. Wehen I took them out they were light and fluffy on the inside and beautifully crisp on the outside. I smiled at their perfection and I have to admit I could hardly stop eating them. They didn’t last long. they were also good sauteed, taking on a similarly golden crispiness and the other two varieties were just as good, passing the taste test with flying colours. If you want to try your hand at growing Sarpo potatoes they are exclusively stocked by Thompson & Morgan the gardening experts. I know I will be sticking a few Blue Danube in my veg patch next year!